Yes - I saved the best for last. This one is so amazing that it seems to me Rob has gone beyond "quilter" and into "textile artist". 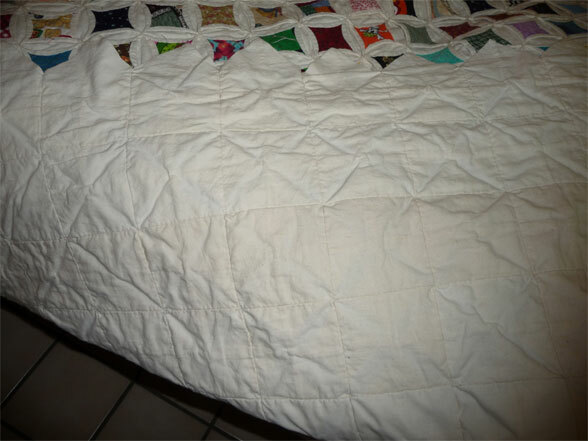 Look at the lovely piece in it's entirety - notice the edging - simple cream blocks forming side border. 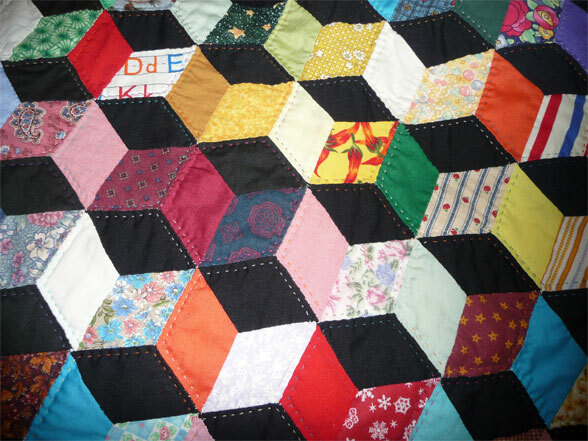 And just as with his other pieces, the overall unity - with colours spread evenly around the top. Here's a closeup. 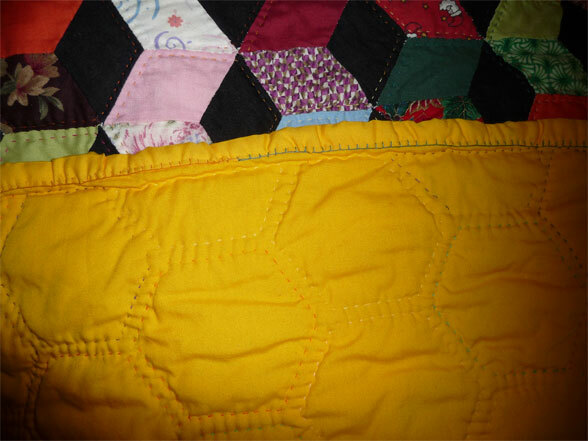 Notice the rounded sides - all rolled and delicately pinched up. 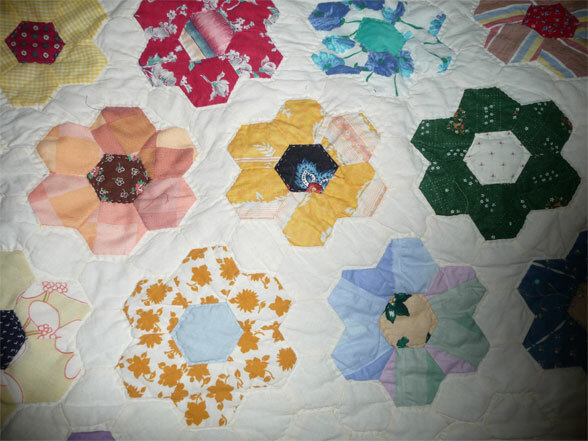 And look at the tiny, fine points in each of those centers - just amazing to me that someone could do that. Honestly... 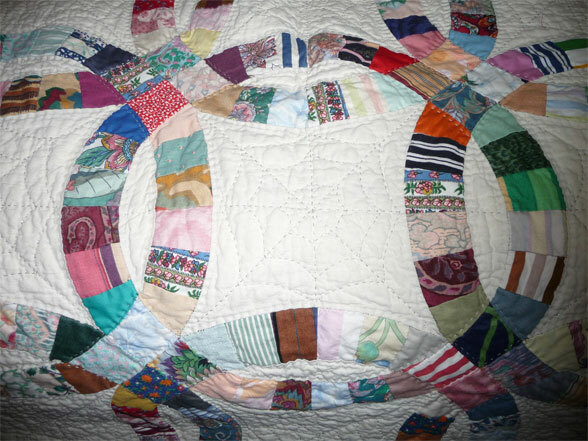 I have no idea how this is done (I'll have to look it up in my quilting books). You can bet I won't be attempting this kind of block - not with my all-thumbs approach to quilting. Again we see some of the same prints as in his other pieces. I especially like the little block in the center of the photo below - the one with the sheet music print - adorable! And the back - so simple, so very simple and so "right". Many thanks to Rob for allowing me to photo a few of his quilts and share them. He's got heaps more, of course, heaps. I'm telling ya - there's a VERY talented man in Colorado.... Wow. And here's a closeup - he's used some of the same prints as he did in the "small squares" quilt I showed you last week. I marveled at how beautifully he's matched things up and he just shrugged and said he was just grabbing whatever piece was handy. I just stand back and go "wow...". Check out the blanket-stitch he's used to secure the binding - simply BRILLIANT! And he's using different coloured threads to boot, lots of visual interest in this piece. 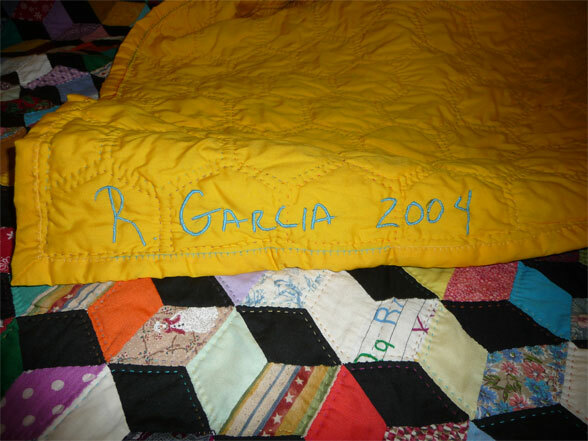 Rob signs the backs of his pieces with a little embroidery. Hm... I should be doing something like this on mine, too.. 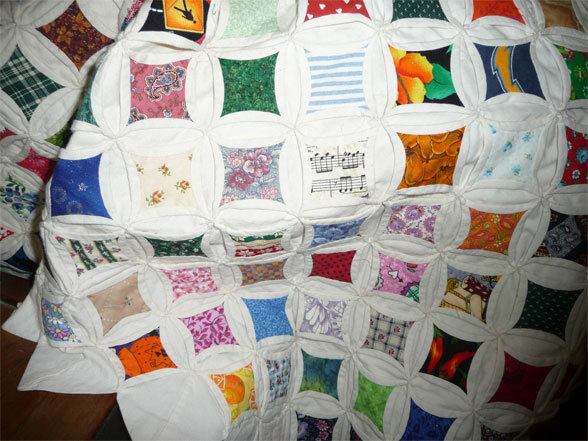 Here's his latest project - it just makes my eyes dance to look at it... .and all hand-pieced. As you've probably guessed, I've saved the best for last. Tune in next week! 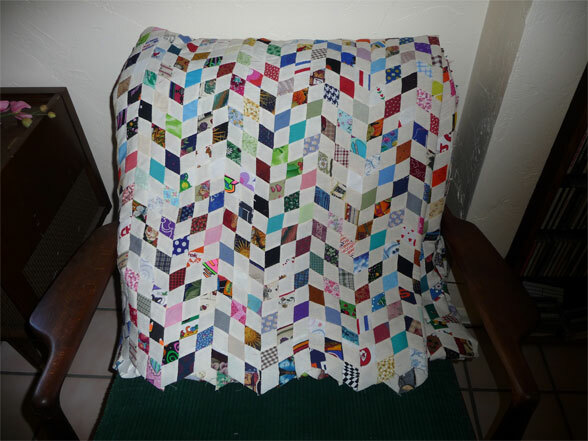 A couple of months ago I visited a long-time friend in Colorado (the friend I made the snowball block quilt top for). 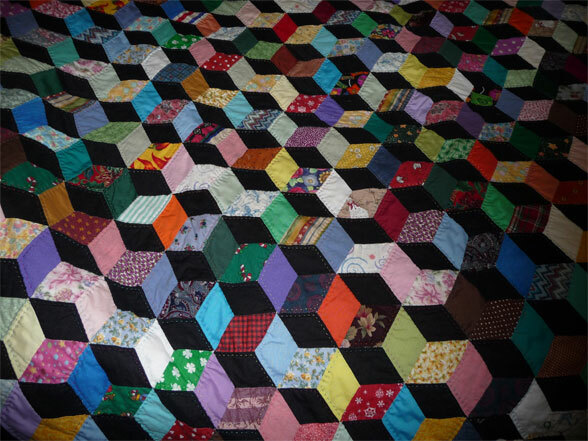 She introduced me to her neighbor Mike, and when we were talking, mentioned the quilt. 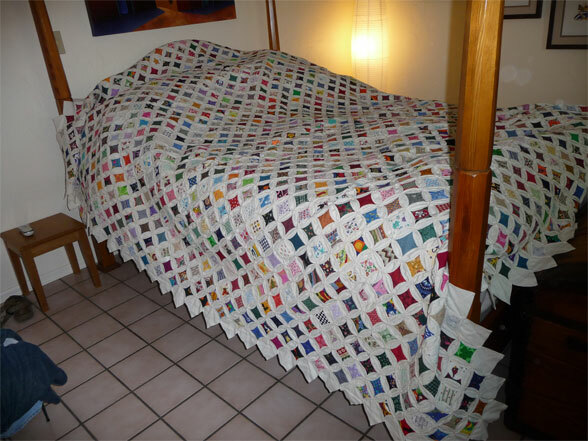 Mike told me his partner Rob quilts, and asked if I'd like to see some of his work. Naturally I was delighted! And oh... what beautiful things. I took a few photos and later asked Rob for his permission to post them here (which he agreed to). There's too much "good stuff" here for one blog post - so I'm putting up some today and will hold some back for later. As you look at these, keep in mind they are all hand-pieced and quilted. 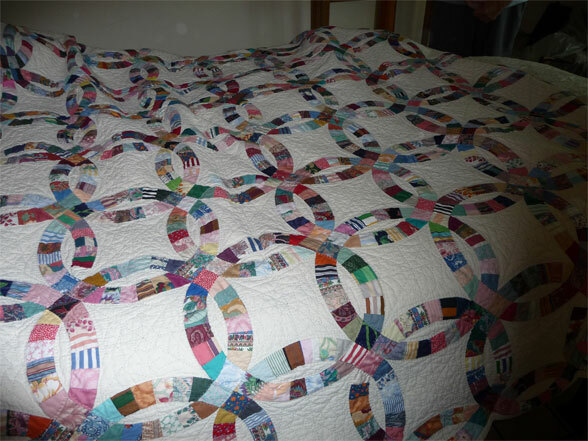 An unbelievable amount of work (I can just see my quilting guru Pauline smiling and nodding at me - she does hand-piecing, too... astounding). 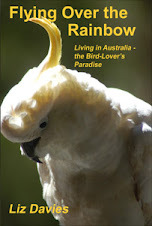 For all of these, doubleclick the photo below to see a larger version of the image. And here's a slightly closer view. 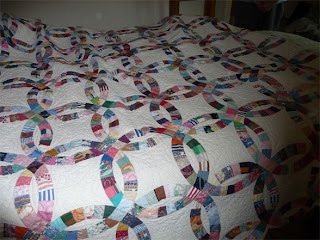 I love the way Rob has played out all the colours - and what a terrific way to use up your scraps! Each little square is only about 1.5". 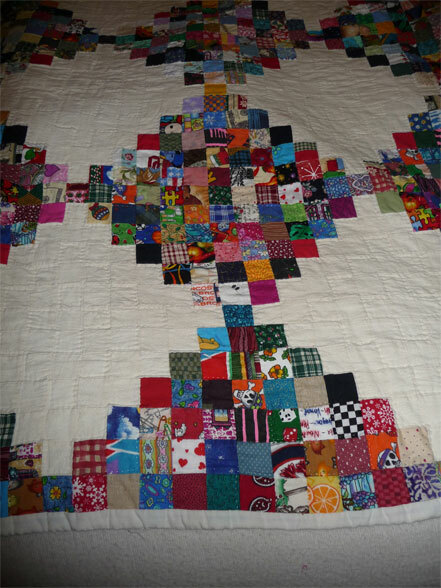 And look at the prints he's got in this - I love the halloween skull-and-crossbones (orange, white, grey print - look in the lower left to see two of those blocks). The quilt as a whole has a "stained glass window" effect - but then you look at these adorable, irreverent prints and you just have to laugh. Terribly clever! I adore the double wedding ring design - but am terrified of it. Isn't it gorgeous? Oh... if I only had more courage. 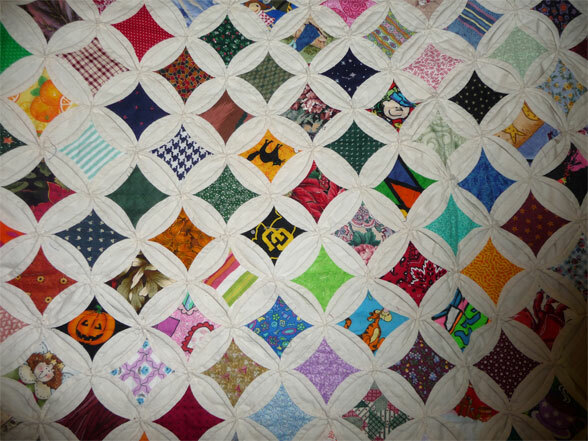 Look at the gorgeous "spider web" stitch design in the center here - is this brilliant or WHAT!?!?!? 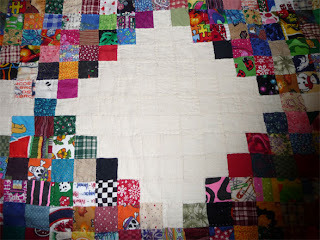 It's called "Amish Star" and I found it on the web. 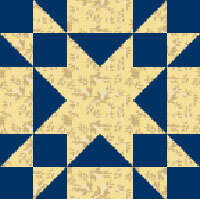 I've done enough quilting now to look at this block design and understand how to reproduce it in calico. I've been looking at it for quite some time and thinking what to use it for. I've got some more of those "William Morris" fabrics (a layer cake and a couple of packs of charm squares), plus a charm square pack of Civil War prints (very bright colours in that one). Hm... yup... I think the Civil War prints.